Put the onion, chilli and garlic in a food processor with the blade attachment and chop very finely, add the mince and all the spices and mix through. 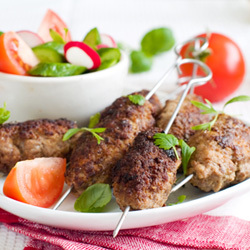 Form meatballs big enough that 5 fit on a normal kebab stick. Brush with oil and braai over wood coals to you required doneness. Serve with a salad and a glass of wine. Recipe reprinted with permission of Potjie.